Halothane, sold under the brand name Fluothane among others, is a general anesthetic. It can be used to start or maintain anaesthesia. One of its benefits is that it does not increase the production of saliva, which can be particularly useful in those who are difficult to intubate. It is given by inhalation. Side effects include an irregular heartbeat, decreased effort to breathe, and liver problems. Like all volatile anesthetics, it should not be used in people with a personal or family history of malignant hyperthermia. It appears to be safe in porphyria. It is unclear whether use during pregnancy is harmful to the baby, and it is not generally recommended for use during a C-section. Halothane is a chiral molecule that is used as a racemic mixture. Halothane was discovered in 1955. It is on the World Health Organization's List of Essential Medicines, the most effective and safe medicines needed in a health system. As of 2014, the wholesale cost in the developing world is about 22 to 52 USD for a 250 mL bottle. Its use in developed countries has been mostly replaced by newer anesthetic agents such as sevoflurane. It is no longer commercially available in the United States. Halothane also contributes to ozone depletion. It is a potent anesthetic with a MAC of 0.74%. Its blood/gas partition coefficient of 2.4 makes it an agent with moderate induction and recovery time. It is not a good analgesic and its muscle relaxation effect is moderate. In rare cases, repeated exposure to halothane in adults was noted to result in severe liver injury. This occurred in about one in 10,000 exposures. The resulting syndrome was referred to as halothane hepatitis, and is thought to result from the metabolism of halothane to trifluoroacetic acid via oxidative reactions in the liver. About 20% of inhaled halothane is metabolized by the liver and these products are excreted in the urine. The hepatitis syndrome had a mortality rate of 30% to 70%. Concern for hepatitis resulted in a dramatic reduction in the use of halothane for adults and it was replaced in the 1980s by enflurane and isoflurane. By 2005, the most common volatile anesthetics used were isoflurane, sevoflurane, and desflurane. Since the risk of halothane hepatitis in children was substantially lower than in adults, halothane continued to be used in pediatrics in the 1990s as it was especially useful for inhalation induction of anaesthesia. However, by 2000, sevoflurane, excellent for inhalation induction, had largely replaced the use of halothane in children. Halothane sensitises the heart to catecholamines, so it is liable to cause cardiac arrhythmias, occasionally fatal, particularly if hypercapnia has been allowed to develop. This seems to be especially problematic in dental anaesthesia. Like all the potent inhalational anaesthetic agents, it is a potent trigger for malignant hyperthermia. Similarly, in common with the other potent inhalational agents, it relaxes uterine smooth muscle and this may increase blood loss during delivery or termination of pregnancy. People can be exposed to halothane in the workplace by breathing it in as waste anaesthetic gas, skin contact, eye contact, or swallowing it. The National Institute for Occupational Safety and Health (NIOSH) has set a recommended exposure limit (REL) of 2 ppm (16.2 mg/m3) over 60 minutes. Halothane activates GABAA and glycine receptors. It also acts as an NMDA receptor antagonist, inhibits nACh and voltage-gated sodium channels, and activates 5-HT3 and twin-pore K+ channels. It does not affect the AMPA or kainate receptors. Chemically, halothane is an alkyl halide (not an ether like many other anesthetics). The structure has one stereocenter, so (R)- and (S)-optical isomers occur. The commercial synthesis of halothane starts from trichloroethylene, which is reacted with hydrogen fluoride in the presence of antimony trichloride at 130 °C to form 2-chloro-1,1,1-trifluoroethane. This is then reacted with bromine at 450 °C to produce halothane. Attempts to find anesthetics with less metabolism led to halogenated ethers such as enflurane and isoflurane. The incidence of hepatic reactions with these agents is lower. The exact degree of hepatotoxic potential of enflurane is debated, although it is minimally metabolized. Isoflurane is essentially not metabolized and reports of associated liver injury are quite rare. Small amounts of trifluoroacetic acid can be formed from both halothane and isoflurane metabolism and possibly accounts for cross sensitization of patients between these agents. The main advantage of the more modern agents is lower blood solubility, resulting in faster induction of and recovery from anaesthesia. Halothane was first synthesized by C. W. Suckling of Imperial Chemical Industries in 1951 in Widnes and was first used clinically by M. Johnstone in Manchester in 1956. It became popular as a nonflammable general anesthetic replacing other volatile anesthetics such as trichloroethylene, diethyl ether and cyclopropane. In many parts of the world it has been largely replaced by newer agents since the 1980s but is still widely used in developing countries and in veterinary surgery because of its lower cost. A meter for measuring halothane. 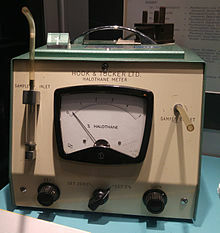 This was used to measure the amount of halothane a flow of inspired gas during anesthesia. Halothane was given to many millions of adult and pediatric patients worldwide from its introduction in 1956 through the 1980s. Its properties include cardiac depression at high levels, cardiac sensitization to catecholamines such as norepinephrine, and potent bronchial relaxation. Its lack of airway irritation made it a common inhalation induction agent in pediatric anesthesia. Due to its cardiac depressive effect, it was contraindicated in patients with cardiac failure. Halothane was also contraindicated in patients susceptible to cardiac arrhythmias, or in situations related to high catecholamine levels such as pheochromocytoma. It is available as a volatile liquid, at 30, 50, 200, and 250 ml per container but in many developed nations is not available having been displaced by newer agents. It is the only inhalational anesthetic containing bromine, which makes it radiopaque. It is colorless and pleasant-smelling, but unstable in light. It is packaged in dark-colored bottles and contains 0.01% thymol as a stabilizing agent. Halothane is an ozone depleting substance with an ODP of 1.56 and it is calculated to be responsible for 1% of total stratospheric ozone layer depletion. ^ a b c d e f WHO Model Formulary 2008 (PDF). World Health Organization. 2009. pp. 17–18. ISBN 9789241547659. Archived (PDF) from the original on 13 December 2016. Retrieved 8 December 2016. ^ James, M.F.M. ; Hift, R.J. (2000). "Porphyrias". British Journal of Anaesthesia. 85: 143–153. doi:10.1093/bja/85.1.143. ^ a b "Halothane - FDA prescribing information, side effects and uses". www.drugs.com. June 2005. Archived from the original on 21 December 2016. Retrieved 13 December 2016. ^ Bricker, Simon (17 June 2004). The Anaesthesia Science Viva Book. Cambridge University Press. p. 161. ISBN 9780521682480. Archived from the original on 10 September 2017 – via Google Books. ^ Walker, S. R. (2012). Trends and Changes in Drug Research and Development. Springer Science & Business Media. p. 109. ISBN 9789400926592. Archived from the original on 2017-09-10. ^ "WHO Model List of EssentialMedicines" (PDF). World Health Organization. October 2013. Archived (PDF) from the original on 23 April 2014. Retrieved 22 April 2014. ^ "Halothane". International Drug Price Indicator Guide. Retrieved 13 August 2015. ^ Yentis, Steven M.; Hirsch, Nicholas P.; Ip, James (2013). Anaesthesia and Intensive Care A-Z: An Encyclopedia of Principles and Practice (5 ed.). Elsevier Health Sciences. p. 264. ISBN 9780702053757. Archived from the original on 2017-09-10. ^ a b Kümmerer, Klaus (2013). Pharmaceuticals in the Environment: Sources, Fate, Effects and Risks. Springer Science & Business Media. p. 33. ISBN 9783662092590. ^ a b Langbein, T; Sonntag, H; Trapp, D; Hoffmann, A; Malms, W; Röth, EP; Mörs, V; Zellner, R (January 1999). "Volatile anaesthetics and the atmosphere: atmospheric lifetimes and atmospheric effects of halothane, enflurane, isoflurane, desflurane and sevoflurane". British Journal of Anaesthesia. 82 (1): 66–73. doi:10.1093/bja/82.1.66. PMID 10325839. ^ "Halothane". 2010-10-31. Archived from the original on 2011-02-16. ^ "CDC - NIOSH Pocket Guide to Chemical Hazards - Halothane". www.cdc.gov. Archived from the original on 2015-12-08. Retrieved 2015-11-03. ^ a b c Hugh C. Hemmings; Philip M. Hopkins (2006). Foundations of Anesthesia: Basic Sciences for Clinical Practice. Elsevier Health Sciences. pp. 292–. ISBN 978-0-323-03707-5. Archived from the original on 2016-04-30. ^ a b c Paul Barash; Bruce F. Cullen; Robert K. Stoelting; Michael Cahalan; Christine M. Stock; Rafael Ortega (7 February 2013). Clinical Anesthesia, 7e: Print + Ebook with Multimedia. Lippincott Williams & Wilkins. pp. 116–. ISBN 978-1-4698-3027-8. Archived from the original on 17 June 2016. ^ Jürgen Schüttler; Helmut Schwilden (8 January 2008). Modern Anesthetics. Springer Science & Business Media. pp. 70–. ISBN 978-3-540-74806-9. Archived from the original on 1 May 2016. ^ Norman G. Bowery (19 June 2006). Allosteric Receptor Modulation in Drug Targeting. CRC Press. pp. 143–. ISBN 978-1-4200-1618-5. Archived from the original on 10 May 2016. ^ "DrugBank: Halothane (DB01159)". 17 December 2010. Archived from the original on 21 November 2011. ^ Niedermeyer, Ernst; Silva, F. H. Lopes da (2005). Electroencephalography: Basic Principles, Clinical Applications, and Related Fields. Lippincott Williams & Wilkins. p. 1156. ISBN 978-0-7817-5126-1. Archived from the original on 2016-05-09.